With the launch of Google Instant in September 2010, SEO experts discussed the impact Google Insant will have on Search Engine Optimization (SEO). Steve Rubel stated that with Google Instant, the result displayed for every user would become different and the basic of SEO which is driven by “same search yields same results” would be altered. The death of SEO was inevitable. Six months down the line, let’s examine the real impact of Google Instant on SEO. Starting with that, let’s brush the understanding of Google Instant once. 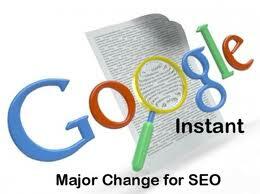 As per About Google Instant page, Google Instant is enhancement of search option which produces results while typing. This leads to display of results simultaneously and one does not have to wait for the \ to appear after Enter. The study involving over 700,000 keyword was undertaken which were searched in relation to four online retailers. The months analyzed were August 2010, October 2010 and March 2010. The study was conducted to determine three things; performance of head terms of search in comparison of “long-tail” , impact on branded searches, if any and lastly, is SEO really over? · Is my site long-term search friendly? When search terms become increasingly refines, will my site rank organically? · Does my site have medium to long tail keywords as anchor text under link building strategy? · Does my site structure allow bots to crawl and index deeper and prospective pages with long-term keywords? · Does my site have presence of branded and non-branded keywords under interlinking strategy for your site? · Does my brand promotion is increased as a result of my site’s link building and social media campaigns? · Does my traditional organic search engine option is depleting due to my mobile search performance? Evaluation Result 3: For the question, Is SEO over?, the answer is NO. SEO is not over. Though the paradigm of organic search is changed, the degree of crawalibility, link building for long-terms, social media campaigning for your site have to be managed through SEO to retain the rank.